This value is an average calculated based on these 41 different studies containing statistics on e-commerce shopping cart abandonment. 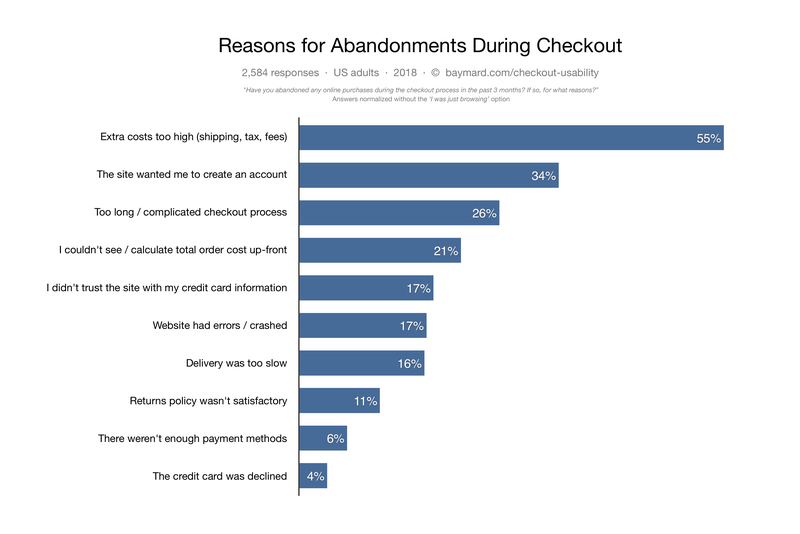 We created this list because we needed some abandonment statistics ourselves for our E-Commerce Checkout Usability study and articles. When searching for these statistics we found a myriad of articles citing the same sources, as well as large fluctuations in the actual abandonment rates. So to save you and ourselves that hassle we decided to gather all statistics in a single place. We’ve also calculated an average so it’s easy to cite just one number instead of 41 different ones. Know of any cart abandonment statistics not on this list? Then send an email to christian@baymard.com. Now in all fairness to the e-commerce industry, a large portion of cart abandonments are simply a natural consequence of how users browse e-commerce sites – many users will be doing window shopping, price comparison, saving items for later, exploring gift options, etc. These are largely unavoidable cart and checkout abandonments. 26% of US online shoppers have abandoned an order in the past quarter solely due to a “too long / complicated checkout process”. Now, our large-scale checkout usability testing shows that an ideal checkout flow can be as short as 12-14 form elements (7-8 if only counting the form fields). In other words, 1 out of 4 shoppers have abandoned a cart in the last quarter due to a “too long / complicated checkout process”, yet for most checkouts it’s possible to make a 20-60% reduction in the number of form elements shown to users during the default checkout flow. And again, this is just 1 of the 134 documented causes for checkout usability issues. If we focus only on checkout usability issues which we – during the past 9 years of large-scale checkout testing at Baymard Institute – have documented to be solvable, the average large-sized e-commerce site can gain a 35.26% increase in conversion rate though better checkout design. And that is despite testing the checkout flows of large e-commerce sites in the US and EU, such as Walmart, Amazon, Wayfair, Crate & Barrel, ASOS, etc. If we look at the combined e-commerce sales of $738 billion in the US and EU, the potential for a 35.26% increase in conversion rate translates to $260 billion worth of lost orders which are recoverable solely through a better checkout flow & design. Now, achieving such gains won’t come easy. But even when we audit leading Fortune 500 companies, who’ve already run a couple of checkout optimization projects, we find that major gains are still possible. And the potential is big: our benchmark of the checkout flows of 50 leading e-commerce sites show the average site has 39 potential areas for checkout improvements. Learn more about our full checkout research findings.